Photographs of Wood Lane are extremely rare and this postcard, which dates from around 1905, is therefore a particularly valuable addition to the museum website. 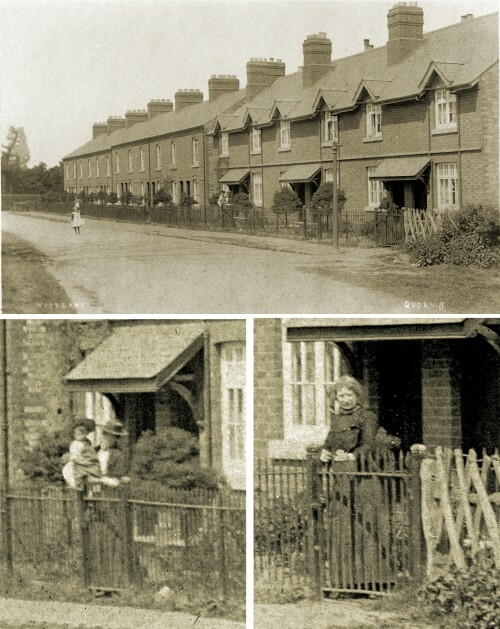 The cottages were built by Wrights elastic webbing factory for their workers in 1893-94, and externally have changed little over the years. Even the iron railings have survived, which is surprising as most railings were removed and used for munitions during either WW1 or WW2. Today the first block of twelve cottages, ie on the left with no porch canopies, are numbered 12 to 34 and the second block of six cottages are numbers 36 to 46. The photograph was very faded, but using enhancement techniques, it has been possible to reveal much more of the original detail. Below the full picture are two enlargements of ladies standing by the gates of two of the houses. Unfortunately, it is not possibly to identify them with any certainty, as each gate served two properties and there were different occupants between the 1901 and 1911 census returns.